New colors! New formulation! New Liquid Pearls!Liquid Pearls has been revitalized! A new palette of 15 beautiful colors in an improved pearlescent formula! 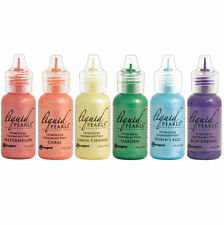 The new Liquid Pearls formula has a more vivid shimmer and pearly finish for the finishing touch on any craft project.